Food is known worldwide for its exclusive taste and style of presentation. When it comes to Indian street food, it manages to create a special place in heart of people, be it for Indian by birth or even foreigners visiting India for travel purpose. If you do not taste Indian street foods then you are truly missing something. While visiting every corner of India you will get that street foods manage to create a niche position in the mind of food lovers. A surprising fact is that besides youth generation these street foods are amazingly popular among office goers. While travelling to and fro for professional life munching of street foods acts a mood booster. A huge population of India earns their daily bread by selling excellent quality street foods and many a times it has been noticed that their earning is pretty good and sometimes even better that the people who are part of corporate world. In party food ideas also these days the street foods are making their place. A popular street food of India is Golgappa. If you taste a single piece of this awesome food, believe me you will become its absolute fan. 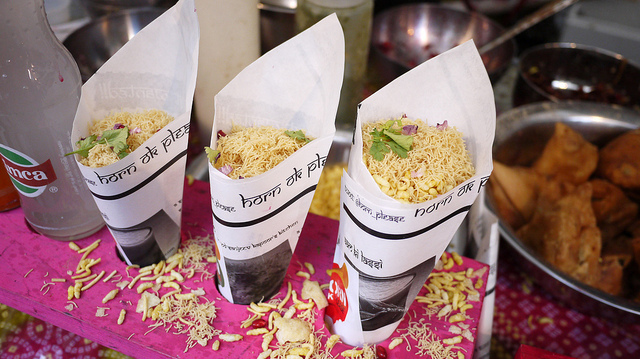 Yummy delicacies of the street food of India will definitely satisfy the taste bud of any food lover. Another amazing fact about the Indian street food is that, same is available at a price which is very nominal and will suit budget of people from every financial background. To know India closely its must for all to taste the delicacies of Indian streets or experiencing life will remain incomplete.